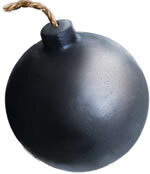 In today's technology-dependent world, the Internet has become a legal lethal weapon against the privacy and reputations of its users. 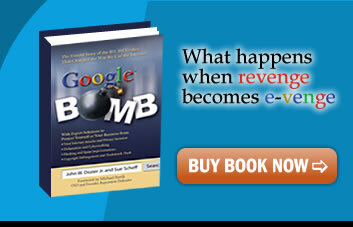 Based on Sue Scheff's landmark Internet defamation case that gave face to online harassment, cyberbulling, privacy invasion, and Google™ bombs (the practice of manipulating the ranking of web pages), and stirred Internet regulation and free-speech debates, Google™ Bomb arms readers with information, legal advice, and reputation defense (and clean up) mechanisms from one of the country's top cyber abuse attorneys, John W. Dozier, Jr.
Dozier, whose firm, Dozier Internet Law, regularly handles legal matters involving online defamation, copyright and trademark infringement, and hacking, uses Scheff's story as a backdrop to lay the groundwork for a personal plan for reputation defense that anyone from business owners and students to job seekers and employers to parents and bloggers can implement easily and immediately. 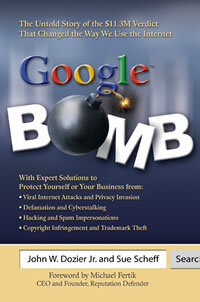 The Explosion of Google™ Bomb - Take Cover Today! Get the knowledge and tools that may help you protect your family, your business, your reputation and your life. Stop feeling helpless when others attack and defame you online - you can fight back. When your reputation becomes "Virtually Incorrect" - turn to Google™ Bomb! Years ago a good reputation went as far as your own little city, now it goes worldwide! Are you ready? Free Speech will not condone Internet Defamation - We all believe in freedom of speech, but when it crosses over into defamation, it can cost you - a very high price tag! Learn more about the "wild, wild, WEB" - and how you can protect your cyber image. Ripped from the Headlines - when a simple ordinary life is ripped a part from a former friend, disgruntled client, upset customer, angry family member, etc.... with a few vicious keystrokes.